A cowlick can drive you insane. It often feels that they cannot be controlled or tamed and though they sit on top of your mind, they definitely have one of their own. Hair on your head goes in 3-directions (forward, backward and to the sides) but points where these hair directions intersect we often find cowlicks. A cowlick is most likely caused because that section of hair gets confused on what direction it is suppose to be going. Most people have a cowlick on the crown of their head, at the nape of their neck or the front hairline at the natural part. Cowlicks are formed very early in life and unless you lose your hair – you’re stick with them for life. So this means we have to learn how to live with them and style them to work with our look and not against us. When you want to tame a cowlick the best place to start with wet hair. Either after a shower or you can simply drench the cowlick. It’s important that you blow dry immediately because if it has time to dry it has time to set. It’s recommended to use a light weight styling product on the drenched hair and then grab a fine-toothed comb and blow dry the cowlick in the direction that you want it to lay. Make sure that the play dryer is flat along the hair shaft. If you have a front cowlick that doesn’t mean you can’t have bangs but it will take a few extra minutes of styling. Grab yourself a round brush for the blow-drying, preferably a boar’s hair brush because they have the highest density of bristles which is perfect for cowlick taming. Start where the cowlick is and then brush underneath section. Grab your blow dryer and make sure you dry down the hair shift and bull the bangs to the right then to the left then straight down. 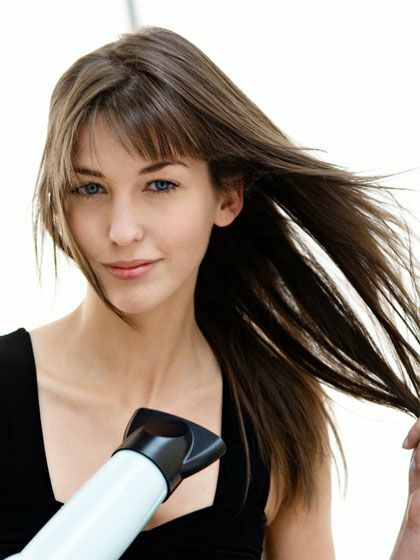 Keep tension on them the entire time with the brush and blow dryer. Tip: If you have side-swept bangs then rather than blow drying straight down you should blow dry and comb to the side you need your bangs to lay. Once you have finished drying your cowlick grab a clip or bobby pins and let your hair sit until it has cooled. If you do this repeatedly it could train the cowlick and eventually it will learn to lie the way that you need it too. You can also purchase hair tape to sleep with to help accelerate cowlick taming and it’s totally safe for your hair. If your cowlick is still acting up after you’ve blow-dried it then you can grab a small hair straightener and simply straighten the cowlick in the direction that you need. Use some gel or hairspray for extra holding strength. Perhaps the easiest way to deal with your cowlick is rather than fighting it – embrace it.